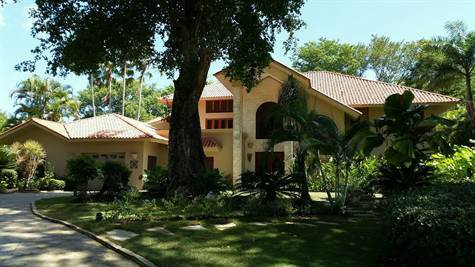 This property is in the prime location of Cabarete, in the premier gated community of the North Coast. Located at the end of a very tranquil cul-de-sac, the property is ocean front separated by green belt, the view of the ocean never to be obstructed..... You walk into a large open area with formal living room, entertainment billiard table that opens to an oversized covered terrace with weather protection screens to a large coral stone terrace surrounding a beautiful oversized pool and heated Jacuzzi.... On the same floor is a separate TV room, dining room with ocean view, sound system for living, dining, kitchen, outdoor terrace, pool area and Jacuzzi. The house is completely and tastefully furnished. Large fully equipped kitchen with separate service entrance and laundry room, 2 refrigerator/freezers, lock-up storage closet ..... Five bedrooms - 2 on the first floor with A/C and 3 on the second floor includes 1 large master bedroom with A/C and large office area with A/C and ocean view. Balconies facing the ocean off all second floor bedrooms ..... All bedrooms have private bathroom plus additional half bath on the first floor...... The beautiful staircase brings you to a large surrounding balcony with open view of the first floor living area giving you an open feeling to the whole house.... The house interior is traditional with mahogany wood work and windows. There is an attached maid's quarter with separate facilities, 3 enclosed garages with remote openers, one attached to the main house, utility pump house with gardener's enclosed area, pool pump house with separate finished room currently used for outdoor furniture storage with enclosed outdoor shower..... The resort offer great amenities such as equestrian center, horseback riding, tennis club and ocean side club/restaurant ..... From your backyard, you can enjoy a magnificent view of the ocean, a few steps to a private small beach and a short walk to the ocean side club/restaurant with ocean side swimming pools with cascades...... A dream Villa in a prime location !! !